It’s a new year and we are officially launching our new 3313 series, 3/4″ Quick Attach pump. This is the start of Remco Industries’ 2018 innovations, and the beginning of standardizing our electric pump models. Remco Industries’ Quick Attach pumps have been around since the start of quick attach, with 2 different sizes available, 5/8″ on our smaller flow 3 chamber pumps and 3/4″ on our larger flow 5. With these two different sizes, it created some difficulty and confusion for our customers to just drop in a Remco pump as a direct replacement for brands such as Fimco (HighFlo) or Flojet. In recognition of this issue, Remco’s engineering team designed this new larger 3/4″ Quick Attach inlet/outlet pump head for our smaller flow 3 chamber pumps (3300 series) to assist in market compatibility and ease of plumbing with no additional adapters needed. This new option now allows us to standardize our quick attach fittings, and plumbing recommendations to many of our OEM/Wholesale customers. 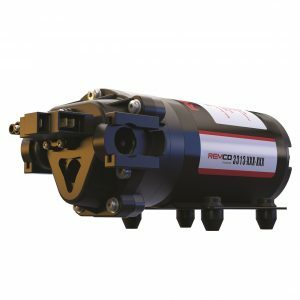 In addition to this design upgrade is the ability of the Remco 3313 series pump to be an easy and direct “plug and play” replacement for the Fimco 2.1 GPM sprayer pump, and its’ special manifold system. Now with this new pump option available, coupled with our significantly superior pump performance, longer pump life, and professional grade quality, it launches us even further ahead of our competition. This next generation port size standardization is a strategic move in helping skyrocket our aftermarket pump sales to the next level. To learn more about our 3313 series 3/4″ Quick Attach pump, please visit our 3300 series pump webpage, http://www.remcoindustries.com/product-pages/3300-pump/.